AMSYS, January 2019. Most people think that pressure transmitters (ready-to-use pressure sensors) need to be steel-housed sensors. 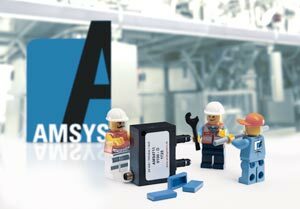 AMSYS shows new ways with its analog pressure transmitters in LEGO-size. These miniaturized transmitters present excellent features of performance, fit for all types of pressure and can be used in several fields of application. The AMS 471X pressure sensors are industrial transmitters, calibrated and compensated in the industrial temperature range of -25 – +85 ° C, linearized and with a supply voltage up to 36 V. The total error depends on the pressure range and is between 0.7 and 1.5% FS over the entire temperature interval. The one-side media resistant transmitters come in a robust plastic package with easy screw connection. ± 5.0 mbar to ± 1.0 bar. This type allows measuring under and over pressure linearly. Ultimately, barometric pressure can be measured with air pressure variants in the range from 700 to 1200 mbar. Sensors can also be calibrated custom-specifically to other pressure ranges on demand. The sensor series AMS 471X consists in three different series with different analog signal outputs. They bear the designations AMS 4710 (10 V output), AMS 4711 (5 V output) and AMS 4712 (4 – 20 mA output). The new AMS 4710 completes the series of high performing industrial pressure transmitters in plastic housing. Areas of application include, beside others, gas flow and back pressure measurement. The AMS 471X can also be used for level measurement for heights of 0 – 50 cm or more in open vessels. The absolute pressure sensor series AMS 471X are suitable for vacuum control as well as for barometric measurements. The analog AMS 471X are smart pressure sensors in a new, robust housing. They are largely miniaturized and easy to install. The AMS 471X are available in different versions for differential, relative and absolute pressure measurements. They are available with a 5 V / 10 V voltage and a 4 to 20 mA current output, responding to industrial requirements for analog output. AMSYS GmbH & Co. KG (www.amsys.de), based in Mainz (Germany) and offers a comprehensive range of innovative humidity, temperature, inclination and pressure sensors. In the field of pressure sensors, this includes analog and/or digital sensors for all pressure types (absolute, relative and differential pressure) from 1mbar up to of 800 bar. The portfolio of products offered by AMSYS extends from wafer-level silicon cells through simple SMD-mountable sensors to ready-to-use pressure transmitters with analog output (voltage and current) and digital interfaces, pressure switches and now also wireless multi-sensors for direct use. The company specializes in low-pressure sensors and their miniaturization. Sensors from AMSYS can be counted among the top high-tech products.